Express transport belts are a faster variant of the transport belt, operating at triple speed. They are the third and final tier among the transport belts. Unlike previous tiers, express transport belts rely on oil processing for lubricant. Therefore, it is recommended to restrict their production in early-game until high throughput is needed. 9 Fast inserter per side will fill an express belt to max. density. (1) See Physics of Transport Belts for more detailed information. Increased throughput from 40 to 45. Updated the belt density to 8 items and removed duplicate links. Transport belt is now connectible to the circuit network. Transport belt connectible entities will now disconnect from incoming belts when marked for deconstruction. 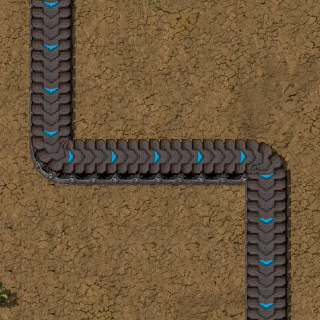 Items on transport belts don't go off the belt at the end, so the transport belt has to go directly in front of the required inserter. Optimised the transport belt movement. Items marked for deconstruction cannot be moved by belts anymore. Reduced the CPU load caused by big counts of inserters loading/unloading transport belts. Fast/express belts are now made from the slower variants. Belts to be deconstructed no longer accept items. Express transport belt now takes 10 Iron gear wheels to craft, down from 15. Transport belt doesn't pull player out of the edge of it (like items), so player won't be almost trapped on faster transport belts. Better movement on transport belts in turns and crossings. Cross connections of transport belt of the same type are disabled. When transport belts are rotated (or replaced with different than opposite direction), items on transport belt are collected.